I’d anticipated getting lots done these last 2 weeks. Last year I made this Avalon top whilst watching Wimbledon. Well this year I seem to have just watched Wimbledon and not made anything whilst doing so… whoops! 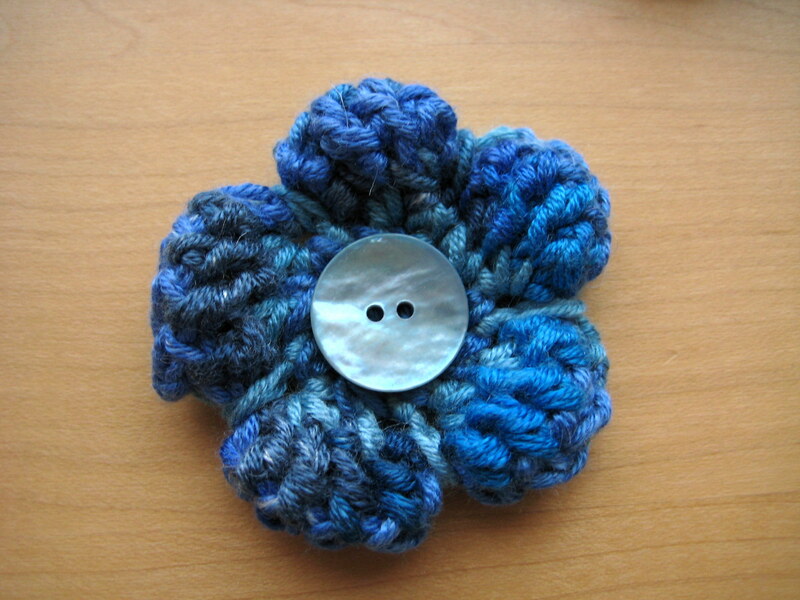 Consequently I’ve had had a bit of a making frenzy and started about 6 projects in one go. My house looks like a whirlwind in a craft store! These puffy flowers were so quick to whip up, at least they are ready enough to blog! 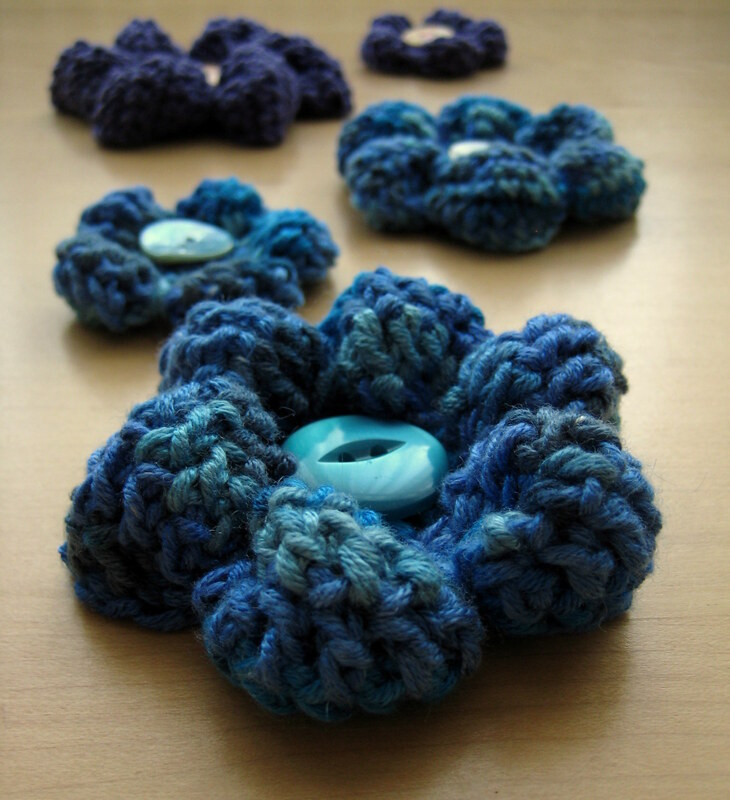 I got the idea for these from a knitted version spotted on Pinterest and tried it a couple of different ways. The first trial (large purple flower pictured) of this was worked in rows with rows of broomstick lace in between the petals and although this was quick, working it in the round is less of a faff especially as you don’t need the broomstick loops! 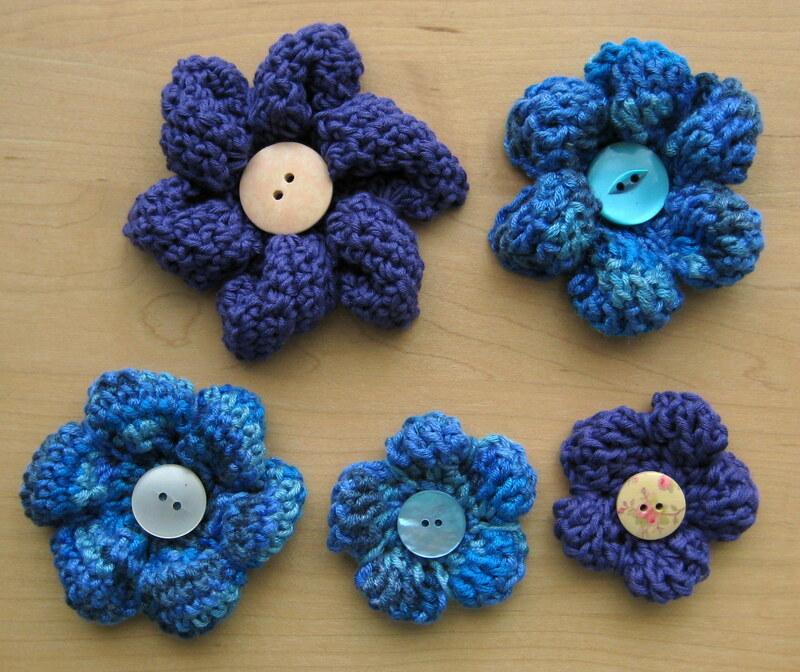 I used a size 4mm hook and stash dk yarn – but I reckon you can use whatever scraps you have with a matching hook for these. Ch48 and sl-st into first ch to join. R3 and R4: Repeat R2. The petals are now made – the next round gathers them up to make them puffy. R5: ch1 (does not count as a st), *sc3tog over the first 3 sts, sc 3tog over the next 3 sts (you will now be at the chain space). Make a sc over all of the chain spaces and the starting chain by passing the hook in front of the work and then under into the middle of the rounds to draw up a thread, then complete the sc. (The tighter you keep this stitch the puffier your petals will be. You can do it loosely if you like but the important thing is to try and keep it even all the way around. Please see the step by step photo if you are struggling with this stitch!) Repeat from * 5 more times (18 sts). Fasten off and weave in ends. 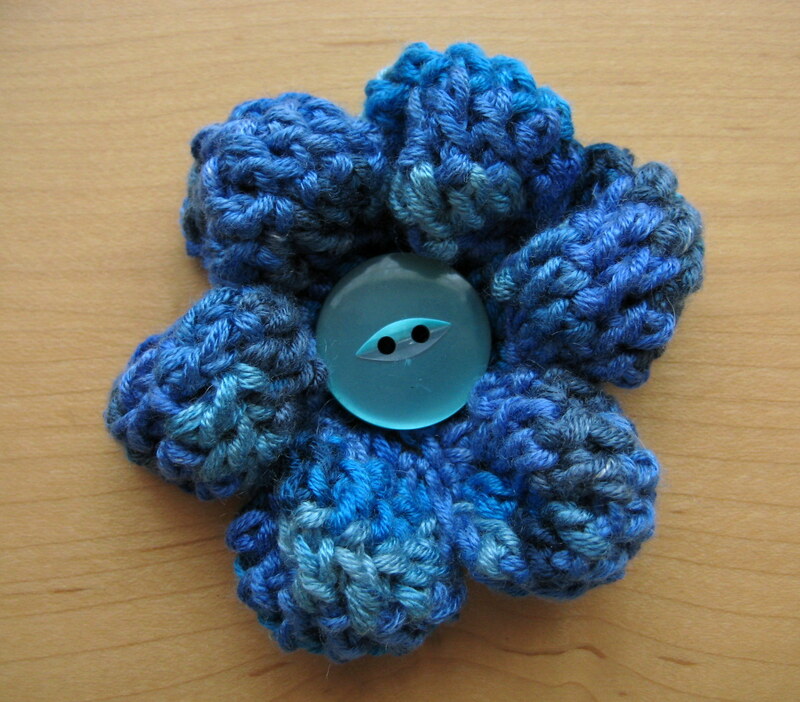 Sew a button onto the flower centre. Ch30 and sl-st into first ch to join. R4: ch1 (does not count as a st), *sc2tog over the first 2 sts, sc2tog over the next 2 sts (you will now be at the chain space). Make a sc over all of the chain spaces and the starting chain by passing the hook in front of the work and then under into the middle of the rounds to draw up a thread, then complete the sc. (The tighter you keep this stitch the puffier your petals will be. You can do it loosely if you like but the important thing is to try and keep it even all the way around. Please see the step by step photo above if you are struggling with this stitch!) Repeat from * 4 more times (15 sts). Stumbled on your blog while looking for a pattern for crocheted fingerless gloves to do for an Ash Ketchum cosplay for my son and signed up to follow as a result. I love these flowers! They will be perfect to go with bun barrettes I’m making for my daughter’s friend who loves both “Hello Kitty” and the color black (needless to say, a challenging combination). I love them, so unusual! I can see me churning them out in vast quantities! One little nit pick, the links to the pdf files both lead to the US version, good job I’m a bilingual Brit! I live in Chile, a country located at the “end of the world”, in South America. Dear Esther thanks for sharing your art, I am very happy for having found your site, congratulations!!! !